Jews worldwide will simultaneously be part of a unique worldwide Jewish Prayer for Peace and Moshiach at 5 pm Sunday, 11 am EDT. Jews around the world will simultaneous be part of a unique worldwide Jewish Prayer for Peace and Moshiach, the Jewish term for the Savior, at 5 p.m. Sunday, 11 a.m. EDT, three days before Yom Kippur. 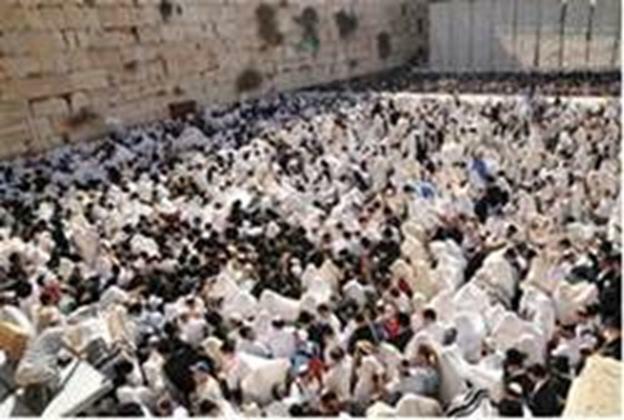 The idea for Jews to pray together at the same moment is to add power to the prayer to G-d to bring the Moshiach and peace to Jews and to all of the world, explained rabbis. The event will take place in California at 8 a.m., in London at 4 p.m., Paris at 5 p.m., and in Australia at 1 a.m. Monday morning. Rabbi Lazer Brody will join Tamar Yonah on her live show on Arutz Sheva - Israel National Radio shortly before 5 p.m. Israeli time to talk about the prayer and then recite it simultaneously with Tamar, listeners and tens of thousands of Jews around the world. A YouTube video explaining the day has been viewed more than 90,000 times. It shows Jews all around the world planning for the day and making sure to set aside money for charity. Under the headline of "All Jews As One," organizers said, "This unique event in Jewish history has been sponsored by motivated Jewish people with help and blessings of rabbis around the world of all affiliations -- Ashkenazim, Sephardim, Chassidim -- with a strong desire that all Jews will be united at the same instant, observant or not, whatever beliefs, affiliation, age, nationality to end all suffering and to welcome the revelation of Hashem's (G-d) Name." The prayer in English is as follows: "Master of the Universe, we the children of Israel ask for Moshiach to redeem us now and with mercy from exile and all suffering to reveal Your name in the world and to bring peace." The event has the blessing of Rabbi Chaim Kanievksy of Bnei Brak, Rabbi Nissim Karelitz of Bnei Brak, Rabbi Lazer Brody, formerly of the United States and currently of Ashdod, Rabbi Shalom Lipskar of Florida, and the French-speaking Rabbi David Pinto of Ashdod. March 23rd 2016 on the Hebrew calendar falls on the fast of Esther, on 13 Adar II, 5776. On the 13th of Adar of the year 3405 from creation (356 BCE), battles were fought throughout the Persian Empire between the Jews and those seeking to kill them in accordance with the decree issued by King Achashveirosh 11 months earlier. (Achashveirosh never rescinded that decree; but after the hanging of Haman on Nissan 16 of the previous year, and Queen Esther's pleading on behalf of her people, he agreed to issue a second decree authorizing the Jews to defend themselves against those seeking to kill them.) 75,000 enemies were killed on that day, and 500 in the capital, Shushan, including Haman's ten sons (Parshandata, Dalfon, Aspata, Porata, Adalia, Aridata, Parmashta, Arisai, Aridai and Vaizata), whose bodies were subsequently hanged. The Jews did not take any of the possessions of the slain as booty, though authorized to do so by the king's decree. (The Book of Esther, chapter 9). Link: The Story of Purim; see also "Today in Jewish History" for tomorrow, Adar 14. The Maccabees defeated the Syrian General Nicanor in a battle fought four years after the Maccabee's liberation of the Holy Land and the miracle of Chanukah. A fast is observed today by all adults (i.e., over bar or bat mitzvah age) in commemoration of the three-day fast called at Esther's behest before she risked her life to appear unsummoned before King Achashveirosh to save the Jewish people from Haman's evil decree (as related in the Book of Esther, chapter 4). The fast also commemorates Esther's fasting on the 13th of Adar, as the Jews fought their enemies (see "Today in Jewish History"). No food or drink is partaken of from daybreak to nightfall. Pregnant or nursing women or people in ill health are exempted from fasting. In commemoration of the half shekel contributed by each Jew to the Holy Temple -- and which the Talmud credits as having counteracted the 10,000 silver coins Haman gave to King Ahasuerus to obtain the royal decree calling for the extermination of the Jewish people -- it is customary to give three coins in "half denomination" (e.g., the half-dollar coins) to charity on the afternoon of the Fast of Esther. (In many synagogues, plates are set out with silver half-dollars, so that all could purchase them to use in observance of this custom). The festival of Purim begins at nightfall tonight, and the Megillah (Book of Esther) is read for the first time this evening. See entries for tomorrow, Adar 14. This will also bring you too Daniel 12, in which lies a very major factor in the riddle of understanding the half time. Factoring in what is stated in Daniel 12 about a time, times and half, which literally broke down means an appointed feast, feasts and a half. The common approach is that the events associated with the 6th seal etc, would fall upon a feast date and by definition this cannot be. Dan 12:7 I heard the man dressed in linen, who was above the waters of the river, as he raised his right hand and his left toward heaven, and swore by Him who lives forever that it would be for a time, times, and half a time; and as soon as they finish shattering the power of the holy people, all these events will be completed. moadah (417b); from H3259; appointed time, place, or meeting: - appointed (3), appointed feast (3), appointed feasts (11), appointed festival (2), appointed meeting place (1), appointed place (1), appointed sign (1), appointed time (21), appointed times (8), appointment (1), assembly (2), definite time (1), feasts (2), festal assemblies (1), fixed festivals (3), meeting (147), meeting place (1), meeting places (1), season (4), seasons (3), set time (1), time (3), times (1), times appointed (1). H2677 חצי chatsi (345c); from H2673; half: - half (76), half-tribe (1), half-tribe *(32), halfway (2), middle (6), midnight *(3), midst (2), two parts (1). So to break this down, appointed feast, feasts and a half, middle, midst, therefore the half cannot and will not fall on a Hebrew feast date. Reckoning the calendar from a 360 day based calendar and dividing this in half is equal to one hundred and eighty days. Then on September 22nd this article appeared on Israel National News as protests broke out and, winter time will extend for 177 days, through April 1, 2013. Thereby adding two extra Sabbaths into winter, which at first glance means little, unless you consider what is said within Daniel 9:27 and Mat 24:20 "But pray that your flight will not be in the winter, or on a Sabbath. Yet also consider what Daniel 7:25 He will speak out against the Most High and wear down the saints of the Highest One, and he will intend to make alterations in times and in law; and they will be given into his hand for a time, times, and half a time. (Dan 7:25) That very thing took place, as an alteration in time had indeed taken place. About 200 people protested the changing of the clock in Israel to take place early Sunday morning. Scant dozens of people trickled into Rabin Square in Tel Aviv early Saturday evening to protest the changing of the clock in Israel Sunday morning. The crowd, made up mostly of Meretz supporters and radical secularists, demanded that summer time (daylight savings time) be extended for at least another month and a half, similar to current practice in the U.S. and much of Europe. At its height, the crowd numbered about 200. MK Ronit Tirosh, who has proposed a law in the Knesset to extend summer time, said that "Interior Minister Eli Yishai is continuing to make promises that the extension of summer time will be legislated during the coming Knesset session, but in reality he knows that the only law that will be passed will be the one to disband the Knesset. Meanwhile, he is forcing Israelis to lose hours of light and waste electricity. Israel, he has again proven, is a 'dark' country." 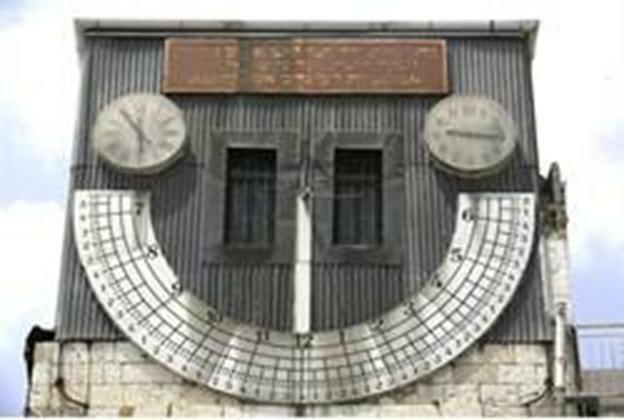 Tirosh was referring not only to the earlier arrival of night that winter (standard) time entails, but to the notion that Hareidi parties like Shas, which Yishai heads, have conspired for decades to prevent later implementation of winter time. After summer time was implemented in Israel several decades ago, several Hareidi groups expressed their opposition because they felt that the later departure of Shabbat in the summer would entail greater violations of the Sabbath. A status quo situation was eventually worked out whereby winter time would be implemented several days before Yom Kippur, and end at the beginning of April, generally before Passover. Critics of the arrangement say that while those who thought the Yom Kippur fast was "shorter" because it ended an hour earlier on the winter clock – as opposed to the extension of the fast by an hour – were just fooling themselves, because the fast lasted for the same 25 hour period. Those who fast respond that while that may be true arithmetically, the fast ends earlier in the evening on winter time, making the time spent fasting during the day shorter, while its adding an hour to Yom Kippur eve is not noticeable. While secularists attribute the winter/summer clock issue to religious extremism, polls show that many in the religious community would not mind extending summer time, especially during vacations, when many families take trips and are forced to return home earlier than they would wish because of the darkness. On the other hand, the Yom Kippur fast is an easier fast on winter time, while the Passover seder and the evening Sabbath meals, which cannot begin until dark, are much harder on children now that Israel is already on summer time. Some religious families usher in the Sabbath an hour earlier than regular candle-lighted time in the summer for that reason. In any event, clocks in Israel will be turned back an hour at 2:00 AM Sunday morning, when the time will once again become 1:00 AM. Winter time will extend for 177 days, through April 1, 2013. H7673a שׁבת shabath (991d); a prim. root; to cease, desist, rest: - brought to an end (1), cease (21), ceased (7), ceases (3), did away (2), disappear (1), do away (1), eliminate (3), gone (1), hear...more (1), lacking (1), left you without (1), made an end (1), make an end (1), no *(1), observe (1), observe the rest (1), put a stop (3), put an end (3), puts an end (1), remove (2), removed (1), rest (3), rested (3), silence (1), stop (2), stopped (1). H2077 זבח zebach (257b); from H2076; a sacrifice: - feasting (1), offer (2), sacrifice (98), sacrifices (54), sacrificial (1), slaughter (1). Breaking this down, he will put a Shabath, Shabath or two Sabbaths, and considering the next word for sacrifice can also mean feasting, then reconsider what transpired because two Sabbaths were added into winter, so that the Feast of Atonement fast would be shortened. You will gain even further insight into this from the readings for the Day of Atonement along with the rabbinical commentary. The Book of Daniel states seal up the prophecy until the time of the end, and this shows that some events in no way could have been understood until they came to pass, and without looking at the Hebrew definitions there is no possible way that this can be seen within the English language. The double placement of the back to back usage of the word Shabath, is not rendered in the English language, as it states above he will put a stop and not Sabbath Sabbath, nor is the word for feasting rendered as such instead the word sacrifice. Then to add into this, Shavuot of 2012 until the date when Israel prays for the latter rain is exactly 144 days apart, from May 26th to October 17th of 2012. Today is the second of the two Rosh Chodesh ("Head of the Month") days for the month of Cheshvan (when a month has 30 days, both the last day of the month and the first day of the following month serve as the following month's Rosh Chodesh). Special portions are added to the daily prayers: Hallel (Psalms 113-118) is recited -- in its "partial" form -- following the Shacharit morning prayer, and the Yaaleh V'yavoprayer is added to the Amidah and to Grace After Meals; the additional Musaf prayer is said (when Rosh Chodesh is Shabbat, special additions are made to the Shabbat Musaf). Tachnun (confession of sins) and similar prayers are omitted. The month of Cheshvan is also called "Mar-Cheshvan." Mar means "bitter" -- an allusion to the fact that the month contains no festive days. Mar also means "water", alluding to the month's special connection with rains (the 7th of Cheshvan is the day on which Jews begin praying for rain (in the Holy Land), and the Great Flood, which we read about in this week's Torah reading, began on Cheshvan 17th). Shavuot began in the evening of Saturday, May 26, 2012, and ended in the evening of Monday, May 28, 2012. Considering all of this, the absolute precision upon which all of these events transpired, and the major prophetic implications, I hope and pray that this has caught your attention. Since this time major events have transpired, the UN resolution granting Palestine statehood, Pillar of Cloud or as the English states Pillar of Defense, the Egyptian President being dubbed Pharaoh, worries that Syria may use chemical weapons and the list goes on and on. Also take note of the fact that the Eclipse that took place on the 13th or 14th dependent upon the time date line, which was the 14th in Israel, was also marked out on a stone showing an event within the Heavens at Los Lunas New Mexico at a place aptly named hidden mountain, which also has a stone with the Ten Commandments inscribed upon them written in an ancient form of Hebrew dating back before Christ, marked off the day that Operation Pillar of Cloud started and is also 888 hours from the infamous date of December 21 2012, which is also locked into the Georgia Ossetia War that started on 8/8/08. 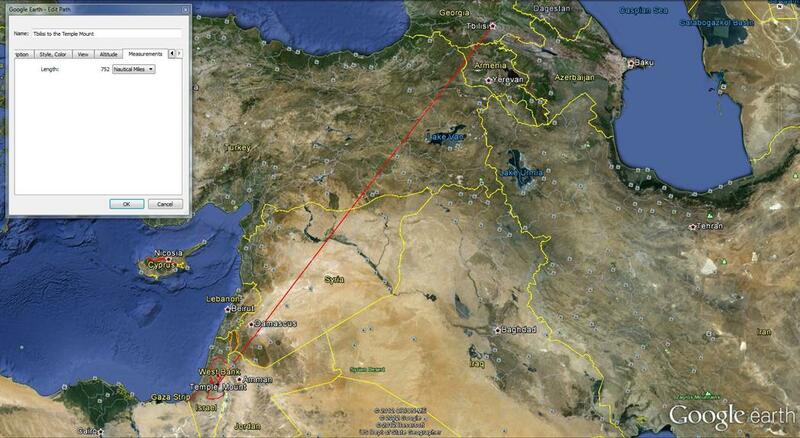 David Flynn revealed where the point of the conflict was exactly 888 miles from the Temple Mount. The President of Georgia Mikheil Saakashvili was also born on December 21 1967 exactly 45 years to the date of December 21st 2012. This again points to Daniel 12, "From the time that the regular sacrifice is abolished and the abomination of desolation is set up, there will be 1,290 days. "How blessed is he who keeps waiting and attains to the 1,335 days! (Dan 12:11-12) The Difference between 1335 and 1290 is exactly 45. "In 1733, Sir Isaac Newton published his book Observations on Daniel and the Apocalypse of St. John. In it he wrote that the 1260 days can also be taken as 1260 years from the establishing of the Roman Catholic Church in the material world in 800 A.D., making 2060 the end of the End Time. Later however, Newton corrected that "the most likely date for the establishing of the Church is 752 A.D. ,when the temporal dominion of the popes began by Pepin the Short's grant to Pope Stephen II," and later confirmed by Merovingian King Charlemagne (Pepin's grandson) in 800 A.D. Adding 1260 years to 752 A.D. gives 2012 A.D.